Okay, I promised this story several posts ago, but other developments in the world of celebrity got in the way. But now it’s time for my Bizarre Philip Kaufman Story, partly because of the sad news, yesterday, of the death of his wife, Rose. She was his collaborative partner in many of his projects; to what extent she contributed I cannot know, but I feel sad that half of a tremendously-creative partnership has been silenced. 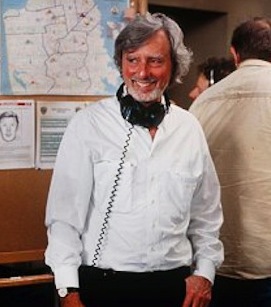 Philip Kaufman is my favorite working filmmaker, and one of the few indications that there is still intelligence in Hollywood. I never thought I’d be tongue-tied meeting a celebrity. And some would argue Philip Kaufman isn’t even a celebrity. After all, he can walk down the street and people don’t know who he is, even many people who love his films (The Right Stuff, The Unbearable Lightness of Being, Henry and June, Quills). But I know what he looks like, and even what he sounds like, as I’ve listened to his audio commentaries on DVD. So one day I was in a San Francisco restaurant called Kokkari. My wife and I had just renewed our passports and decided to get some lunch. She’d gone off to the ladies’ room and I was staring at the restaurant’s bar. For some reason, even though the resemblance was slight, it made me think of a scene in The Right Stuff: astronauts are sitting at a hotel bar in Florida where one can watch underwater swimmers through a glass backdrop behind the bar. Something about the lighting and colors at the Kokkari bar reminded me of that scene. So naturally I then got to thinking about Philip Kaufman in general. My wife returned from the ladies’ room. So, just as I’m thinking about Philip Kaufman, the front door to the restaurant, which I’m facing, swings open, and…Philip Kaufman starts walking towards me. At first I amusedly think the human brain is so feeble that I will register anyone with a silvery beard and hair as PK, but as he gets closer it’s clear that’s who he is. And he’s walking right towards me, even looking at me. I wonder if I’m dreaming. He walks right up to me—wondering why I am staring at him with my jaw dropped, no doubt—before settling into the table behind me, against the wall. His wife, Rose, a small, curly-haired woman, and a young man I assumed to be his son Peter, are with him. I wasn’t completely convinced it was Philips Kaufman yet, however. Then I heard him speak. PK has a very distinctive voice, and I recognized it instantly. So of course I went over and introduced myself, right? I’m ashamed to say, I did not talk to my favorite living film director. First of all, the encounter was weird, and he was wondering why this shocked guy was staring at him. And if I’d told him, “You know, I was just thinking about you as you walked through the door,” well, that would have probably seemed strange too. Sometimes I wish I had talked to him. There are a lot of questions about his films I’d have loved to ask. His films are very rich and every time I watch them I notice something new or have some sort of question. But he probably just wanted to enjoy a nice lunch with his wife and son, a quiet respite from busy schedule. Maybe it’s a good thing the jerk at the other table didn’t ruin it for him. And I can only imagine how I’d have reacted had it been Orson Welles! Sometimes, it’s just best to leave your idols alone. This entry was posted on December 16, 2009 by John Grabowski. It was filed under Entertaining Welsey Shaw . I probably wouldn’t have approached, either, John. A lot of us get a bit shy in the presence of greatness.